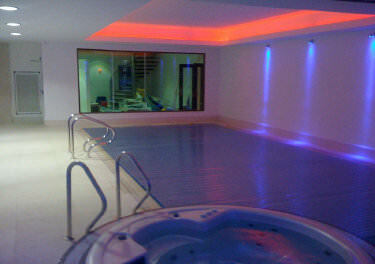 Our clients were building a new 20-room mansion complete with indoor swimming pool. We installed an Audio Visual and Security system that served 16 televisions and a Home Cinema with projector and motorised screen. To coincide with the build, the installation had to meet very demanding needs and took more than a year to complete. While working on the project, we were flattered to be included among over 500 guests invited to the wedding of the client’s son, which was held in a massive marquee in the grounds of the mansion. It’s a sign of the good relationship we typically have with our customers. The client required a system that would provide shared and dedicated audio from various centrally located rack mounted source equipment and local iPod docking stations to 17 zones with provisions for expanding the system at a later date. 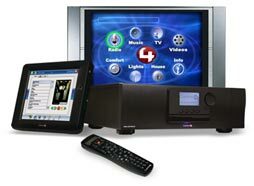 The control of the Audio system and all other services integrated into the Control4 system was achieved using a 7” Colour in-wall Touch Screen, Controllers at a number of TV set positions to provide on screen graphics, the Control4 programmable remote controls and using the app for iPad/iPhones. The client required a system that would provide terrestrial digital TV, Sky Satellite TV and High Definition Video via a professional True 16×16 video matrix switch from various centrally located rack mounted source equipment such as his SKY TV and Kaleidescape Blu-Ray/DVD Server to 16 no TV sets (supplied by the client and installed by us) and 1no Home Cinema Projector. As with the control of the Audio system, all TV sets, source equipment and projector are controlled by the same devices and programmed to operate with the minimum of button presses. The specification for this discipline was that there was minimal impact on the room’s aesthetics. 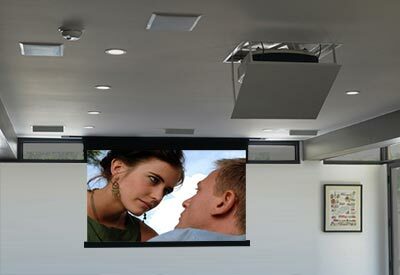 The projector and screen had to be hidden when not in use and the speakers had to be ceiling mounted. We opted for the Panasonic HD projector as not only does it produce excellent picture quality, it has a long throw ratio required for the size of the room. This was mounted on a motorised lift to conveniently hide it away. The screen was a motorised 2.4m tab tensioned pro grade screen again mounted within the ceiling void and finished with a trim to cove the aperture when the screen is closed. 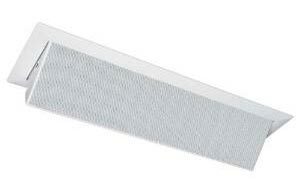 The speaker package consisted of 3no Motorised KEF in ceiling speakers for the Left, Centre and Right Channels with a further 4 KEF in ceiling speakers for the rear surround sound. The 200W KEF Sub-Woofer provided excellent base to fill the room. The heart of the system was an Onkyo 7.1 Network compatible receiver. The network system comprised of 22no dual CAT5 data outlets with each room having at least 1 dual outlet so that the client has the facility to have a hard wired internet connection anywhere in the mansion via the 48 port Cisco gigabit switch. We also installed a Panasonic PABX 4 line input and 16 extension telephone system with intercom facilities. The client required a whole home lighting control system to provide mood lighting to 74 circuits. We installed the Philips Dynalite lighting control system with 46no premium keypads finished in black Borosilicate Glass. We also automated a number of blinds and curtains in key rooms such as the Cinema room so that when the Home Cinema system was activated the curtains also closed, the lights dimmed whilst opening up the screen and projector lift all from the touch of 1 button. We also integrated the lights with the Control4 system so that the lighting control can also be operated using the Control4 touch screen, Remote Control and iPhone/iPad app. Security was a very important requirement with the client so we used very high quality Panasonic cameras with external and internal PTZ cameras and vandal resistant IR external cameras strategically place giving whole coverage of the exterior areas. All cameras are recorded and can be remotely monitored. 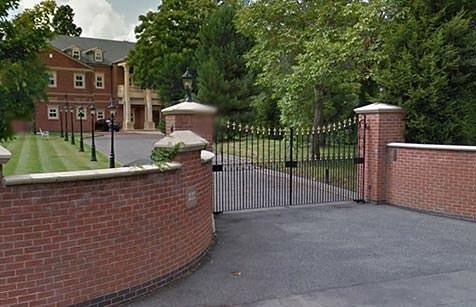 The entrance gates to the property were automated using discrete underground control motors. Access is achieved by using the Comelit video door/gate entry system with a stainless steel vandal resistant entry panel with numerical keypad by the gate which calls 3no colour hands free door entry monitors. When a visitor presses the call button the Control4 system will mute all music around the house, play a doorbell chime through the speakers and can even pause your Movie and display the camera feed on any designated TV. The intruder alarm covers the whole mansion and is fully monitored. The used of ultra reliable dual tech detectors, door contacts and panic alarm buttons means that the client and his family have peace of mind for their safety. With the addition of smoke and heat detectors and integration with the Dynalite lighting system also provides additional security by bringing on designated lighting circuits inside the property in the event of any alarm activation.